The event administrator has closed online registration for this event. Last chance registration will take place during packet pickup on Friday, December 14 from 12-7pm at the Lampson International Office, 607 E Columbia Dr, Kennewick, WA 99336. This year marks the 40th anniversary of the Lampson Cable Bridge Run! In celebration of this milestone Finisher Medals will be given out to the first 2000 participants who finish the run. To receive your medal please ensure that your race bib is visible as you cross the finish line. So tell your friends and come out and enjoy this fun and exciting holiday tradition! Runners, no matter the distance they choose (1Mile, 5K, or 10K) will start their race crossing over the Columbia River from Kennewick to Pasco, WA on the scenic Cable Bridge and all racers will end at the Lampson warehouse and warm up with Hot Doctor Pepper and enjoy the camaraderie of other participants. New this year there is a discounted, non-timed 1 mile fun run category for those that want to experience the fun and excitement of this yearly event, and still receive the 40th Anniversary finisher medal. Also new this year, is a child 4 and under category that is free of charge. Participants in this category will receive a bib but will not be timed or receive a finisher medal. For all timed race categories, timing chips are used and awards are given to the top participants in each age category. So if you are a competitive runner or someone who just wants to have fun walking with your friends, the Lampson Cable Bridge Run has what you are looking for. If you would like to purchase additional T-Shirts please select the, "T-shirt ONLY" event and you may purchase without registering. If you or your business are interested in sponsoring the 2018 Lampson Cable Bridge Run, Please contact the Pasco Recreation Services Office at (509) 545-3456. *Participants will have the choice of purchasing either a cotton/poly long-sleeved t-shirt ($7) OR a long-sleeved technical t-shirt ($9) with their registration. 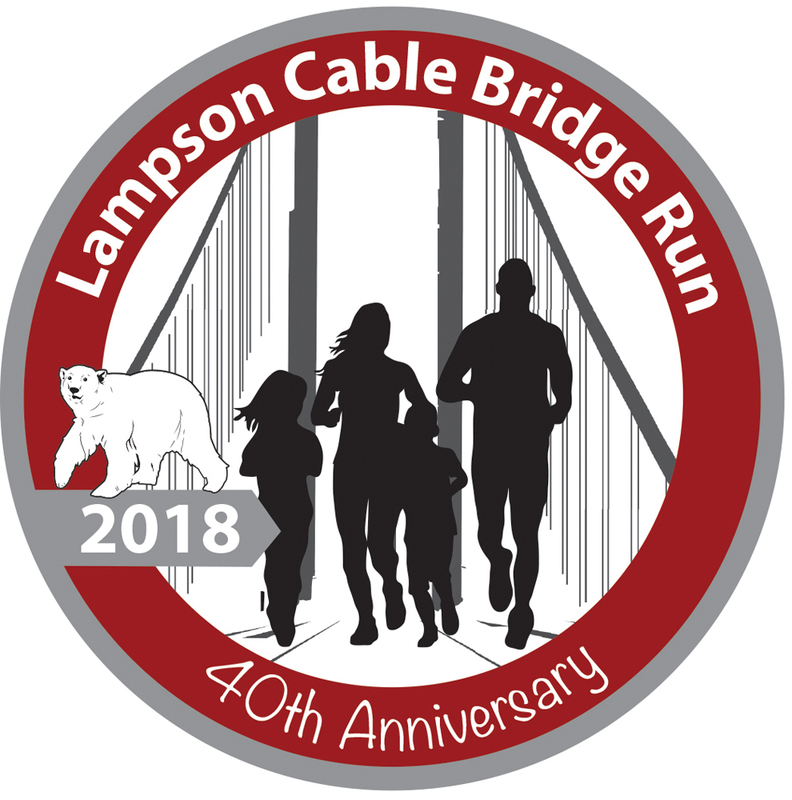 2018 marks the 40th Anniversary of the Lampson Cable Bridge Run! In celebration Finisher Medals will be given out to the first 2000 participants who finish the run. To receive your medal please ensure that your race bib is visible as you cross the finish line. LAMPSON CABLE BRIDGE RUN WAIVER: In consideration of you accepting this entry, I, the participant, intending to be legally bound do hereby waive and forever release any and all right and claims for damages or injuries that I may have against the City of Pasco, City of Kennewick, Neil F. Lampson, Inc., Port of Pasco, Ben-Franklin Transit, Washington State Department of Transportation, Washington State Patrol, Pasco Jaycees, Racewire and their officers, agents, employees and volunteers for any and all injuries to me or my personal property. This release includes all injuries and/or damages suffered by me before, during or after the event. I recognize, intend and understand that this release is binding on my heirs, executors, administrators, or assignees. I know that running a road race is a potentially hazardous activity. I should not enter and run unless I am medically able to do so and properly trained. I assume all risks associated with running in this event including, but not limited to: falls, contact with other participants, the effects of weather, traffic, and course conditions, and waive any and all claims which I might have based on any of those and other risks typical found in running a road race. I acknowledge all such risks are known and understood by me. I agree to abide by all decisions of any race official relative to my ability to safely complete the run. I certify as a material condition to my being permitted to enter this race that I am physically fit and sufficiently trained for the completion of this event. In the event of an illness, injury or medical emergency arising during the event I hereby authorize and give my consent to the Event Director to secure from any accredited hospital, clinic and/ or physician any treatment deemed necessary for my immediate care. I agree that I will be fully responsible for payment of any and all medical services and treatment rendered to me including but not limited to medical transport, medications, treatment and hospitalization. I agree not to hold City of Pasco responsible for any lost or stolen items if I choose to use the clothing shuttle service. I understand and acknowledge that the Registration Fee is Non-Refundable. By submitting this entry, I acknowledge (or a parent or adult guardian for all children under 18 years) having read and agreed to the above release and waiver. Further, I grant permission to all the foregoing to use my name, voice and images of myself in any photographs, motion pictures, results, publications or any other print, videographic or electronic recording of this event for legitimate purposes. DATED this ____ day of ______________, 2018.